With artistic creativity, Janel strives to inspire students, engage them in learning and integrate curriculum in a meaningful way. As a teacher, she has a great understanding of the curriculum and the importance of students’ voice. Process art allows students opportunity to be themselves, make their own decisions, take risks and just create! The process of the artistic endeavour is equally important to the product. Whether it is life drawing, sketching, illustrating or perspective drawing, this form of art allows children to express themselves, process their world, experiment with tools and techniques and develop fine motor skills. Techniques focusing on shape, size, lines and patterns can be taught to build confidence, break barriers and encourage risk taking! 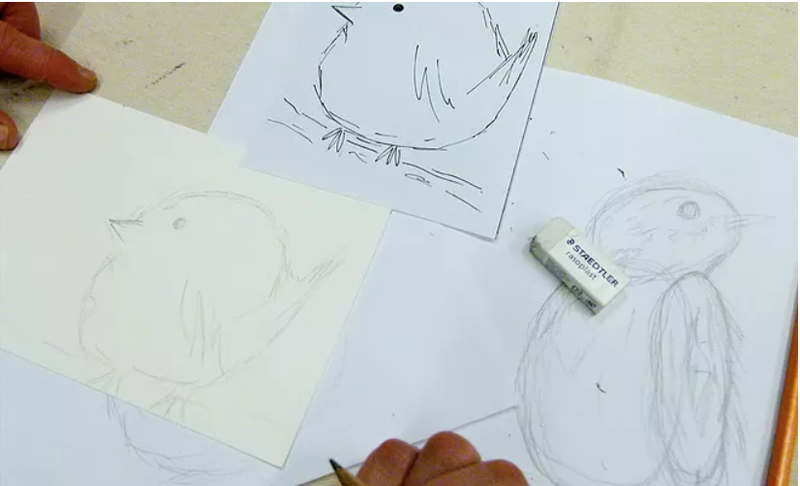 Drawing can easily be integrated into learning and is a great creative tool for inquiry, discovery and reflection. From pencil to ink, charcoal to pastels, there are endless tools that make drawing fun and interesting! From gesture painting, abstract, narrative to emotive, this mode of creative of expression can be done on walls, paper, canvas, wood, glass, clay, concrete, fabric and found objects. I offer instruction in acrylic, watercolour, ink, tempera and handmade paints from plants and edibles. Mixed media art refers to a visual art form that combines a variety of media in a single art-work. It is very closely related to assemblage (3-dimensional sculptural form) and collage (rearrangement of pre-existing objects such as old book pages, stamps, buttons, nature items etc). All these items are then glued to a surface. With mixed media, anything goes, the sky is the limit! “Printmaking is the process of making artworks by printing, normally on paper”. As one of the oldest forms of ‘mark making’, impressions are created from the designed image using a variety of techniques such as woodcuts, relief, lino-cuts and stamping. Unlike painting or drawing, printing allows for reproduction of the ‘original’ which students often love. Printmaking is exciting, unique and the process in itself is an amazing learning experience.